PURPOSES: The Society was founded for the collection and preservation of coins, medals, decorations and paper money and for the investigation of their history and other subjects connected therewith. DUES: The annual dues for an Associate Membership are $15.00. Issues of the Notes and Monographs, Museum Notes and Numismatic Literature are distributed to all members. PUBLICATIONS: The American Numismatic Society Museum Notes is a scholarly journal containing articles on numismatic topics. The Numismatic Notes and Monographs consist of separately issued publications, each on a single topic. Numismatic Studies is a series accommodating works in a larger format. Numismatic Literature, published twice each year, is an international abstract bibliography of the current literature in the profession. The Society is also engaged in the systematic publication of its entire Greek coin collection in Sylloge Nummorum Graecorum: American Numismatic Society. MUSEUM: The Society maintains a museum located in uptown Manhattan, New York City, which houses its offices, collections and library. Collections embrace coins of all periods from their inception to modern times, medals and decorations. Selections from its cabinets are on display in an exhibition. The library, consisting of about 25,000 volumes, covers all branches of numismatics. The museum is open to Members and the public from 9 a.m. to 4:30 p.m. on Tuesdays, Wednesdays, Thursdays, Fridays and Saturdays. In addition, the public exhibition is open on Sundays from 1 to 4 P.M. The museum is closed on Mondays and the following holidays: New Year's Day, Lincoln's Birthday, Independence Day, Election Day, Thanksgiving Day the fourth Friday in November, the fourth Saturday in November, December 24, Christmas Day. The public exhibition is open to the public from 9 a.m. to 4:30 p.m. on the fourth Friday and the fourth Saturday of November. The coins of Nero present a bewilderingly rich variety of obverse legends and reverse types. The principal varieties have indeed been described in the celebrated catalogues of Roman Imperial Coins compiled by Eckhel, Cohen, Fiorelli, Sydenham, Mattingly, Miss Robertson and others—each largely based on one of the great numismatic collections. But although considerable progress has been made in listing the varieties, identifying the denominations and distinguishing the mints, the basic pattern of the coinage and its successive chronological stages have largely remained obscure. 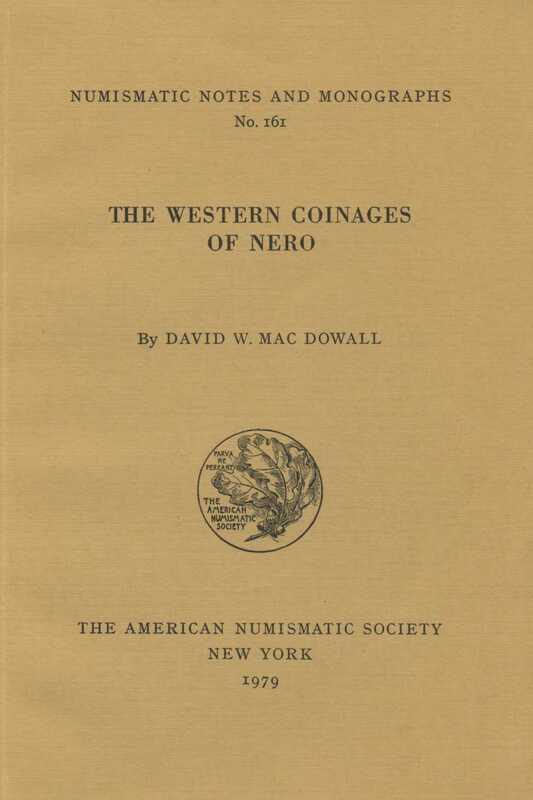 This study of the western coinages of Nero seeks to apply to this rich coinage the principles of die study and type analysis. A new corpus has been established of the varieties that can be substantiated from coins in the principal numismatic collections. Whenever possible, examples have been cited from distinct obverse and reverse dies to distinguish the normal varieties of the coinage from the exceptional variants. The evidence of site finds has been used to clarify the attribution of uncertain groups, and this body of evidence has then been analyzed to establish the chronological sequence of successive issues and to reconstruct the administrative subdivisions of the mints. As in any work of this kind, my obligations are numerous. I am indebted to the Board of Management of the Bryce and Amy Mary Preston Read Scholarship Fund and to the Trustees of the Arnold Historical Essay Fund for generous help which has greatly facilitated the collection of material. My thanks are due to the curators and owners of the numerous collections in Western Europe cited in this work for allowing me to examine and study the coins in their charge, and to the curators of coin cabinets in Scandinavia, Eastern Europe and the United States of America for sending me detailed information and photographs of material in museums that I have not been able to visit. Without their friendly help and cooperation, this project could never have been completed. Many scholars have generously discussed relevant subjects with me. R. A. G. Carson, J. P. C. Kent, C. M. Kraay, F. A. Lepper, C. H.V. Sutherland and the late Mlle. G. Fabre have kindly allowed me to study a number of their unpublished papers. I am indebted to Sra. de Moya for sending me rubbings of coins in some Spanish collections that I was unable to visit, to H. Jucker for discussing problems of Nero's portraiture and for sending the photographs of the Terme bust of Nero reproduced in Plates XXIV and XXV, and to Almirall Barril, who has long been interested in the coinages of Nero, for information about the interesting material he has added to his collection over the years. But above all I should like to record my gratitude to the late John Walker, formerly Keeper of Coins in the British Museum, for the facilities which he so freely granted me both before and after I joined the staff of his department, and to C. H. V. Sutherland, Keeper of Coins in the Ashmolean Museum, Oxford, for the constant help which he has given me so generously since I first became his pupil. Public collections are listed under the name of the town in which they are to be found, except for those of the American Numismatic Society, British Museum and Hermitage Museum. Private collections are listed under the name of their owner. Where a collection has been offered for public sale reference is given to the printed sale catalogue and the date and place of sale. Private collections known to have dispersed are shown in Italics. The abbreviations are those used in the Catalogue section. For most of the more common varieties it would be possible to quote examples from any of the major collections. The British Museum, Oxford, Paris, Vienna, Vatican and Terme collections are normally cited in preference to others because they were the collections most accessible to me during the early stages of this study. Wherever possible varieties are substantiated from public collections. New York, see American Numismatic Society. The basic chronological framework for the arrangement of Nero's coinages is provided by the elements of imperial titulature found on the coins. Nero held the consulship five times, in 55, 57, 58, 60 and 68, 1 and his first and fourth consulships are recorded on the gold and silver. 2 Considerably more important are the series of tribunician dates found on the pre-reform aurei and denarii and on a limited number of the later sestertii and dupondii, and the use of "imperator" as a praenomen during the later years of his principate. Unfortunately both the reckoning of Nero's tribunicia potestas, and the date when he assumed the praenomen imperator have been disputed. Nero celebrated the renewal of his tribunician power on 4 December, 3 fifty two days after his dies imperii of 13 October. 4 He counted it from 4 December 54, and added one to each TRP number on 4 December in each succeeding year. Apart from this unusual starting date, there is no need to assume any irregular reckoning. The supposed difficulty in calculating Nero's TRP has been the apparently contradictory entries in two surviving fragments of the Arval Acta. For 3 January 59 Nero's titles are given as TRP V …, 5 but both the general heading for 60 and the specific entry for 3 January of that year have TRP VII IMP VII, 6 whereas on a normal reckoning one would expect to find TRP VI IMP VII. This gave rise to Mommsen's view that during 59 Nero changed his TRP renewal day to 10 December (the day of the consilia) and subsequently counted TRP I as 15 October to 9 December 54 with TRP II as 10 December 54 to 9 December 55. Nero would thus regard TRP VII as 10 December 59 to 9 December 60. 7 We now know that the Arval Acta commemorated Nero's dies imperii on 13 October in 58 4 and the bestowal of his tribunicia potestas on 4 December in both 57 and 58 3 —the sole years for which the relevant parts of the Acta survive. Any alterations, therefore, in numbering Nero's TRP cannot have been occasioned by a change in the starting date of the tribunician year. The 4 December was already in use by 57, whereas the discrepancy in the numbering of Nero's TRP does not appear until after the entry for 59. The other epigraphic and numismatic evidence 8 supports a straightforward reckoning of Nero's TRP from 4 December 54. Most inscriptions merely establish a connection between a particular TRP date and the number of an imperial salutation. Three inscriptions, however, have an additional external date. The military diploma in Vienna granted to Iantumarus 9 is unfortunately indecisive. Although it gives a consular dating AD VI NON IVL CN PEDANIO SALINATORE L VELLEIO PATERCVLO COS besides TRIB POT VII IMP VII COS IIII in Nero's titles, the date of their suffect consulship is uncertain. 10 But the other two inscriptions are more helpful. Lucretianus' dedication from Luna 11 shows Nero as TRIB POTEST VIIII IMP VIIII and Poppaea as Poppaea Aug Neronis Caesaris Aug Germ. Poppaea gave birth to a daughter, Claudia, in 63 and both she and the child were given the title of Augusta immediately afterwards. 12 The Luna dedication thus supports the straight calculation which would make TRP VIIII December 62/63. On Mommsen's system TRP VIIII would have to be December 61/62 which is a year too early. The Boeotian inscription from Acraephia recording Nero's declaration of liberty to Greece 13 and Epameinondas' speech of thanks, has δημαρχικῆς ἐξουσίας τὸ τρισκαιδἐκατον. Hammond has shown that the assembly took place on 28 November 67, 14 and this again supports the straight calculation which would make TRP XIII December 66/67. Nero's gold and silver coinage forms a regular series from TRP to TRP X without interruption, and gives no suggestion of any change in tribunician reckoning. The aurei and denarii of 60 have the normal COS IIII TRP VI. 15 This issue seems to be the production of a complete year, and its TRP date directly contradicts the entry in the Arval Acta of COS IIII TRP VII for 3 January of the same year. l. 23/4. immolavit/in sacram viam (sic) memoriae Cn …. d. l. 16. Caesari (sic) Aug Germanico (to agree with consule). The imperial titles for 3 January 59, moreover, are given as TRIB POT V IMP VI COS III DESIG IIII; 19 a designation to COS IIII so far ahead as 3 January is most unlikely in view of the constitutional show which Nero's principate was anxious to maintain at this period 20 and it is likely that an entry proper to the closing months alone of the year has been put in full for 3 January. The entry COS IIII TRP VII for 3 January 60 appears to be a closely comparable error. When the Acta for 60 were formally written up at the end of the year, the engraver apparently inserted the current year's date COS IIII TRP VII (December 60/61), for January 60—an error which it would be extremely easy to make by assimilation to the neighboring IMP VII. A. Degrassi, I fasti consolari dell'impero romano (Rome, 1952), pp. 15ff. Cat. 3, 9ff., 37, 42 ff. Corpus Inscriptionum Latinarum (hereafter CIL) VI, 2039, 2041. Theodor Mommsen, Hermes 2 (1856), p. 56 and Römisches Staatsrecht II (3rd ed., Leipzig, 1887), pp. 796ff. Mommsen has been followed by B. W. Henderson, Life and Principate of the Emperor Nero (London, 1903), Appendix C., p.449; L. Constans, "Les puissances tribuniciennes de Néron," Comptesrendus de l'Académie des inscriptions et belle-lettres (CRAI) 1912, p. 385; E. A. Sydenham, The Coinage of Nero (London, 1920), pp. 23–28; and R. Cagnat, Cours d'épigraphie latine (4th ed., Paris, 1914), pp. 183ff. Mommsen's view has been attacked by H. F. Stobbs, Philologus 32 (1873), pp. 1–91; H. Dessau, Geschichte der römischen Kaiserzeit II (Berlin, 1926). p. 196, note 1 and in notes to inscriptions in Inscriptiones Latinae Selectae (ILS); H. Mattingly, "The Date of the 'Tribunicia Potestas' of Nero and the Coins," NC 1919, pp. 199–200 and "'TRIBVNICIA POTESTATE.'" JRS 1930, pp. 78–91 and M. Hammond, "The Tribunician Day During the Early Empire," Memoirs of the American Academy in Rome 1938, pp. 23–32. See Table 1, pp. 6–7 below. CIL XVI, 4. (= ILS 1987). Degrassi, I fasti, pp. 16–17. Tacitus, Annals xv.23. On the right hand edge of the stone of this dedication are the remains of the D and N, one above the other, which seem to stand for D(ivae Claudiae …) N(eronis …)—and provide an additional argument for dating the inscription to a.d. 63. It is interesting to note that Lucretianus was apparently very careful to record the imperial titulature correctly. His second dedication dated TRP XIII gave Nero the praenomen IMP, whereas his dedication of a.d. 63 did not. The numismatic evidence shows that Nero assumed the praenomen IMP during the course of TRP XII. Inscriptiones Graecae (IG) VII, 2713. Hammond, "Tribunician Day," p. 28, following M. Holleaux, BCH 1888, pp. 510–28 and more fully in his Discours prononcé par Néron à Covinthe en rendant aux Grecs la liberté, 1889; and Dittenberger, IG VII, 479. The other important chronological indication is Nero's use of IMP as a praenomen 21 from 66. All the known inscriptions dated TRP XII (December 65/66) and later have the praenomen IMP, whereas those dated TRP—TRP XI never have it. The Acta for 66 repeatedly refer to IMP NERO 22 whereas in the proceedings up to and including 60 (the last year before 66 where Nero's titles are recorded) Nero is never given the praenomen. Titinius' dedication at Luna dated TRP XIII IMP XI COS IIII (December 66/67) 23 is to Diva Poppaea and Imp Nero, whereas his earlier dedication in TRP VIIII (62/63) 24 repeatedly gives Nero's titles without the praenomen. The Acraephia inscription 25 dated TRP XIII gives Nero the praenomen αὐτοκράτωρ; and the Sardinian milestone dated TRP XIII IMP XI 26 has the praenomen IMP. An apparent exception, the stone from Casino 27 (no longer extant), seems to have been incorrectly transcribed. It is reported without the praenomen and dated TR POT XIII IMP VIII (sic). But this is an impossible combination which cannot be accepted, and TR POT VIII IMP VIII, a conjunction known from another inscription, 28 is the obvious emendation. The dated and undated coinage, moreover, shows clearly that once adopted, the use of the praenomen remained the regular form. The most mature portraits of Nero, with a thick treatment of the neck and a heavily developed jowl, are always found on coins with the praenomen. The terminus post quem for the assumption of the praenomen is given by the cuirassed bust sestertii dated TRPOTXIPPP and the three inscriptions dated TRPXI. The terminus ante quem is fixed by the entries in the Arval Acta for 66, with the caveat, perhaps, that the titulature may have been correct only for the end of the year when the record was completed. Within these limits it is difficult to be more precise. Either the Vinician conspiracy of 66, 37 or the ceremonial reception of Tiridates at Rome during the summer of the same year 38 are equally possible occasions. But although the precise context remains obscure, the praenomen is most important chronologically and enables us to distinguish the later groups in the undated coinages. TRP Aurei Cat. 2, 3. TRP II Aurei Cat. 4. Inscr. AE 1897.30 (IMP II COS). TRP III Aurei Cat. 5, 6. Inscr. CIL II, 183 (IMP III COS II DES III); II 4734 (IMP III COS II DES III). TRP IIII Aurei Cat. 7. Inscr. CIL IX, 4115 (IMP COS III); VII, 12 (IMP IIII COS IIII sic); XII, 5471 (IMP IIII COS III PP); XII 5473/5; III 346 (IMP V COS III). TRP V Aurei Cat. 8. Inscr. CIL II, 4657 (IMP II sic); II 4652 (IMP IIII sic); II 4683 (IMP IIII sic); VI 2042 (IMP VI). TRP VI Aurei Cat. 9. TRP VII Aurei Cat. 10, 11, 12, 13. Denarii Cat. 43, 44, 45, 46. Inscr. CIL XVI, 4 (IMP VII COS IIII); VI 2042 (IMP VII COS IIII). TRP VIII Aurei Cat. 14, 15, 16. Denarii Cat. 47, 48, 49. Inscr. CIL III 6123 (IMP VIII COS IIII PP); II 4888 (IMP VIIII COS IIII). EE VIII p. 365 (COS IIII IMP VIII PP); AE 1900, 18 (IMP VIII COS IIII PP). TRP VIIII Aurei Cat. 17, 18, 19. Inscr. CIL XI, 6955 (IMP VIII COS IIII). TRP X Aurei Cat. 20, 21. Inscr. AE 1947, 167 (IMP VIII COS IIII PP). TRP XI Inscr. CIL III, 6741/42 (COS IIII IMP VIIII); AE 1919, 22 (IMP COS IIII PP). TRP XIII Sestertii Cat. 167–74. Inscr. CIL X 5171 (IMP VIII sic); XI 1331 (IMP XI COS IIII); IG VII 2713. TRP XIV Sestertii Cat. 175, 176. C. H. V. Sutherland, Coinage in Roman Imperial Policy (London, 1951), pp. 152ff. Later emperors regularly included the praenomen in their titulature from their accession, but this practice did not go back further than Vespasian. Cf. D. McFayden, History of the Title Imperator under the Roman Empire (Chicago, 1920). L. Laffranchi, "Il predicato P(ROCOS) dei sesterzi di Nerone e la Profectio Augusti," AttiMemIIN 4 (1921), pp. 47–62. BMC RE I, p. 215, note on no. 111. Cohen, Description historique des monnaies frappées sous l'empire romain (2nd ed., Paris, 1880–92) I. Nero 260 quoting the Wigan collection. Ingemar König's recent study, "Der Titel «Proconsul» von Augustus bis Traian," SM 1971, pp. 42–53 republishes and illustrates six of these sestertii. Some varieties of obverse and reverse legend and type are characteristic of the mints at which the coinage was struck, and the chronological pattern of the issues cannot be determined until the basic mint structure is appreciated. The evidence of finds shows clearly that Rome was the sole mint for the issue of precious metals in the west, but that there were two principal mints, Rome and Lugdunum, for the aes coinages. From these western issues we must be careful to distinguish the coinages struck by a wide range of mints in the eastern provinces. There is little difficulty over the product of city mints which employed Greek legends or of colonies which added to their Latin legends the initial letters of the name of the colony. 1 Rather less obvious are the coins with Latin legends struck by the imperial mints at Caesarea 2 and Antioch 3 and by the military mint in Moesia, 4 but each of these series is characterized by a distinctive range of reverse types. sive chronological stages and not the differing practices of individual mints. Minor differences in reverse types, such as the placing of the legends SALVS and ROMA across the field instead of in the exergue, are similarly chronological distinctions. There is, moreover, no clear indication of any difference in the relative proportion of aureus and denarius reverse types between finds in Italy and the western or eastern provinces. It is of course theoretically possible that, even though the gold and silver dies were engraved centrally, and the major part of the precious coinage was struck in Rome, some aurei and denarii may have been struck at branch mints. 14 But there is no clear evidence to support such a hypothesis. The Vichy inscription 15 mentioning a soldier of cohors XVII Lugdunensis ad monetam, attributed to the time of Claudius or Nero, can quite well refer to the aes mint which continued to function at Lugdunum under the Flavians. 16 There is no need to refer it to the continued presence of the gold and silver mint, known to be at Lugdunum in a.d. 18. 17 Nor do finds of ancient dies support the hypothesis of subordinate mints. Only three such finds of dies are known for Nero. 18 One in the Museum at Arlon, found locally, is certainly the product of an ancient forger, as it is a metal mould for casting 44 denarii at a time. The other two, both in the Bibliothèque Nationale, Paris, are obverse dies for aurei or denarii. One was "probably found in France" and the other is "said to have been found in France c. 1816," but both may very well have been used by ancient forgers. Many plated denarii are known for Nero as for all the other early emperors. 19 Most of them are in good style and some have argued that they may have been produced by official mint(s) as a measure of illicit profit for the government. 20 But whatever one's verdict on plated denarii of Claudius and earlier emperors, it is now clear that Nero's plated silver was the product of unofficial forgers. The analysis of Nero's coinages has closely defined the issues of denarii and the obverse and reverse types used in each issue. Had the plated denarii been produced under official auspices they would undoubtedly have been made in the same mint organization with the same combinations of types as the regular denarii in good silver. But whereas hybrids between issues do not occur on good denarii, they are comparatively common within the plated group, combining not only the obverse and reverse types of different issues, but sometimes even obverse and reverse types of different emperors. Whether the dies for these plated denarii were illegally appropriated from an official mint, or whether they were the work of competent private engravers, 21 there can be little doubt that the manufacture of plated denarii was the work of forgers. The places at which finds of early imperial dies have been discovered are singularly out of the way. 22 None has been found in Rome or Lyons, the two known mint cities of the early empire. Nor have any been found in other places where one would expect there to be branch mints (if such were the organization)—towns such as Trier, Arles, Amiens, London—the central location of which commended them as mint cities in the widely changed conditions of the late empire. There is nothing to show that the coins struck from these dies were made under official auspices in the localities where the dies were discovered. In only one case has it been shown that an impeccable coin was struck from one of these dies, 23 but even this die may well have fallen into the hands of forgers by appropriation from the mint after it had been used to strike official coins. And it seems most likely that the dies recovered from these scattered find spots were the property of ancient forgers. Bullettino della Commissione Archeologica Communale di Roma 56 (1930), pp. 1ff. Fiorelli, Pompeianarum Antiquitalum Historia. I.3, pp. 250–51. Opgravingen op het dompe in te Utrecht, Haarlem 1934, pp. 49ff. Fonds Vacquer à la Bibliothèque de la ville de Paris. The late Mlle. Fabre kindly sent me details of this find. NZ vol. 34, pp. 29ff. Mitteilungen C. C. Steiermark 2, 173; 3, 157; 5, 109. K. Regling, "Der Schatz römischer Goldmünzen von Diarbekir (Mardin)," BlM 1930–33, pp. 353–381. M. Thirion, Le lrésor de Liherchies. Aurei des Ier et IIe sièdes (Brussels 1972). N. A. Mouchmov, "Le trésor numismatique de Reka-Devnia", Annuaire du Musée National Bulgare 1934 Supplément. MSS. list in British Museum. Sydenham, The Coinage of Caesarea in Cappadocia (London, 1933), pp. 36ff. W. Wruck, Die syrische Provinzialprägung von Augustus bis Traian, (Stuttgart, 1931), pp. 63ff. D. W. Mac Dowall, "Two Roman Countermarks of a.d. 68" NC 1960, pp. 103–112. My argument is not open to the sort of objection that M. Grant makes ("The Mints of Roman Gold and Silver in the Early Principate," NC 1955, p. 44) to C. H. V. Sutherland's attribution of Claudius' gold and silver to Rome— "surely we cannot argue that certain gold and silver is of Rome because of a stylistic resemblance to aes which we believe to be Roman''—for it merely points to the existence of imagines of two distinct types and identifies the type used on the aurei and denarii. F. Lenormant, La monnaie dans l'antiquité III (Paris, 1878), pp. 185ff. CIL VI, 42, 43, 44, 239, 791, 1145, 1607, etc. Tenney Frank, An Economic Survey of Ancient Rome III (Baltimore, 1937), pp. 150ff. Frank, Survey III, pp. 166ff. Cf. A. H. M. Jones, "The Aerarium and the Fiscus," J RS 1950, pp. 22–29. In this discussion I use the generic term "treasury" to cover the activities of both aerarium and fiscus. Nero's building operations were extensive (see Platner and Ashby, A Topographical Dictionary of Ancient Rome (London, 1929), p. 595; Nero spent heavily on games, donatives, gifts, etc. Suetonius, Nero, 10.1; 11; 30; Tacitus, Annals 12.58. Tenny Frank, An Economic History of Rome (2nd ed. Baltimore, 1927), p. 491. The capital had a permanently adverse balance of trade. Cf. Frank, Survey V (1940), pp. 281–82. A suggestion made by Sutherland in a review of H. R. W. Smith, Problems Historical and Numismatic in the Reign of Augustus (Berkeley, 1951) in NC 1952, p. 145. Cf. M. Grant NC 1955, pp. 53–54. CIL XIII, 1499, and Mommsen, Hermes 16 (1881), p. 645. BMC RE II, p. lviiif. for Vespasian's aes mint at Lugdunum. C. C. Vermeule, Some Notes on Ancient Dies and Coining Methods (London, 1954), pp. 29–30. For plated denarii of Nero see pp. 35 and 243 below. L. A. Lawrence, "On Roman Plated Coins," NC 1940, p. 194, believed that we should regard plated coins as part of the governmental issues, and so apparently does Sutherland, Coinage in Roman Imperial Policy, p. 201; but Mattingly BMCRE I, p. xlivf., is doubtful about their official origin. Sydenham, "On Roman Plated Coins," NC 1940, pp. 2ooff., thought the St. Swithin's Lane hoard was the product of a forger but that plated denarii were also produced by the mint. But M. H. Crawford's article "Plated Coins— False Coins," NC 1968, pp. 55–59, argues convincingly against this, and shows that except in irregular coinages produced in periods of civil war, plated coins must have been forgeries. The western aes of Nero falls into two basic types. 24 The first is characterized by a small globe at the point of Nero's bust on the obverse, and a characteristic M form of bust truncation (see Plates XIII, 432; XIV, 452). The style of portraiture of this group is quite distinctive and the varieties of obverse legend and reverse types, established by an analysis of well preserved coins with the globe (see Cat. 401–633), constitute an objective basis for attribution to this group even when the globe and form of bust truncation are not visible on worn or corroded coins. The second type has no globe and a straighter form of bust termination (see Plate II, 71, 74). The style of portraiture is again distinct, and the analysis of well preserved coins enables us to establish the distinctive forms of obverse legends and reverse types that characterize this group (see Cat. 70–335). The distribution of these two types in the years immediately after their issue is the basic evidence for the localization of the mints at which the two types were struck. It is not however sufficient merely to list the localities at which examples of each type are said to have been found, as this can sometimes obscure the original pattern of distribution. Single coins may have been lost at any time during the period of their continued circulation; and unusual types are liable to attract attention because they are unusual, whereas the ordinary pass unnoticed. It is therefore important to distinguish the quality of different categories of evidence, and to determine the general character of circulation in an area from the recurrent statistical pattern observed at a number of localities. The best evidence consists of finds which accurately reflect currency circulating at a known point of time, because they can be given a secure terminus ante quem . 25 But there are comparatively few commercial hoards and stratified or closed sites which meet these rigorous canons. The next best evidence consists of the accumulated finds from a thoroughly excavated site, or the accumulated deposits recovered from a well or river bed. Such coins may have been lost at any time during their continued circulation, but it is a reasonable inference that the commonest types will have been most commonly lost; and where the finds from a site are sufficiently numerous, they should provide a reasonably accurate statistical pattern of circulation. For regions where this quality of evidence is not available, some idea of distribution may be found by noting casual finds recorded in archaeological publications or noted in local museums. The cumulative totals of such finds may be less reliable statistically, if there has been any preference in acquiring or noting specimens of new and rare varieties or in declining badly preserved specimens of common types. Finally, in the absence of other evidence, it is often possible to form an approximate estimate of circulation from the un- provenanced collections of local museums. The general character of some collections suggests quite strongly that it is largely composed of local finds even though the museum has not kept accurate records, but such evidence must be used with great care. A—A hoard or excavation finds with terminus ante quem of a.d. 80 or before. B—The aggregate of coins from other excavations or deposits. D—Unprovenanced coins probably found locally. For localities where there is adequate evidence from finds classified A and B, finds of other categories which cannot contribute anything further to the picture of distribution have not been cited. Where it is necessary to cite casual finds, the evidence of groups of coins which have greater statistical validity has been preferred to that of single finds. Finds of sestertii, dupondii and asses in Britain, Upper and Lower Germany, Belgica, Lugdunensis and Raetia are almost all of the "globe" type; finds from Narbonensis are predominantly of the "globe" type; finds from Spain, Noricum, Pannonia and the area east of the Rhine and north of the Danube are divided between the "globe" and the "non-globe" type; and finds from Italy are almost all of the "non-globe" type. In the following list, coins are attributed to the "globe" and "non-globe" mint on the basis of the criteria set out in this monograph. By analyzing the varieties of coins in good condition it is possible to establish those forms of obverse legend and reverse type found exclusively at the "globe" mint, those found exclusively at the "non-globe" mint and those which occur at both mints. These criteria enable us to attribute many find coins to the appropriate mint, even when globe, aegis or bust truncation may not be visible. This section is intended merely to indicate the pattern of circulation for each locality—not to constitute an exhaustive list of finds. It would be possible to add further entries for many localities, but they could hardly affect very significantly the overall picture. Crawford, "Plated Coins," pp. 56–57, shows that a plated Republican denarius in Hannover was struck from dies, mechanically copied from a pure silver coin. Vermeule, Ancient Dies, pp. 29–30. RN 1946, "Procès Verbaux," pp. ii–viii, though of course others too may have been "official" dies. Cf. J. G. Milne, "The Interpretation of Coin-finds" Finds of Greek Coins in the British Isles (London, 1948), pp. 15–16; cf. also Greek and Roman Coins and the Study of History (London, 1939), pp. 95–96. Totals from Reports of the Research Committee of the Society of A ntiquaries of London , Nos. 6, 7, 10 and 16. Now in Rowley's House Museum, Shrewsbury. NC 1841–42, pp. 147–168. The figures are for those coins now in the British Museum. Ant J 1962, pp. 40–41. Local finds in Rijksmuseum G. M. Kam, Nijmegen. BonnerJb 1904, pp. 263–67, and now republished by H. Chantraine in Novaesium III Die antiken Fundmünzen der Ausgrabungen in Neuss (Berlin, 1968). Bon ner Jb 1904, p. 450. MainzerZ 1911, pp. 71–72; 1912, p. 84; 1913–14, p. 66; 1918, p. 25; 1929, pp. 66f. C. M. Kraay, Die Münzfunde von Vindonissa (Basel, 1962). Bonner Jb 1897, pp. 89–91. Musée de Besançon. I am indebted to Lucien Lerat and Yves Jeannin for giving me detailed information about the coins in the Besançon Museum and their provenances. J ahrbuch der Gesellschaft für lothringische Geschichte 1894, p. 322. J bGeslothGesch 1899, p. 326. Bulletin de la Société Archéologique de Sens 21 (1905), pp. 235–49. Bulletin de la Société d'Archéologie, Sciences, Arts et Belles-lettres de la Mayenne, 1865, pp. 9ff, 32–36. Through the kindness of M. Bisson I have been allowed to study the unpublished part of this large deposit. Seen by M. Grant in trade, cf. NC 1955, pp. 21–37. Cf. P. F. Fournier "Les travaux de 1956 au sommet du Puy de Dôme," Bulletin Historique et Scientifique de l'Auvergne 1956, pp. 196–201. Through the kindness of the late Mlle Fabre of the Bibliothèque Nationale, I have been permitted to examine this hoard, which has now been published by J. B. Giard, RN 1964, pp. 151–57. P. F. Fournier, Bulletin Historique et Scientifique de l'Auvergne 1939, p. 3. Orange Musée from excavations in the theatre. J. Sautel, Vaison dans l'antiquite II (Avignon, 1926), pp. 78–79. St. Remy-en-Provence Musée from Glanum, and H. Rolland, Fouilles de Glanum.—Gallia Suppl. 1 (Paris, 1946), p. 23. Musée des Antiquités Nationale, St. Germain-en-Laye. Formerly in Maison Carrée, Nîmes. Seen by M. Grant in trade, Toulon. Die Fundmünzen der Römischen Zeit in Deutschland 1962 (FMRD) I.7. Schwaben 7001. H.-J. Kellner, Die römischen Fundmünzen auf dem nördlichen Teil von Rätien. Fundberichte aus Österreich II, p. 296. F. Pichler, Repertorium der steierischen Münzkunde II (Graz, 1867), p. 12. Pichler, Repertorium II, pp. 12, 14–15. Museum Carnuntinum, Bad Deutsch Altenberg. Pichler, Repertorium II, pp. 13–14. Šime Ljubić, Popis Arkeologičkoga Odjela Nar. Zem. Muzeja u Zagrebu, pp. 132ff. Pichler, Repertorium II, pp. 12–15. 1925/30 excavations in Forum, now in Museo Arqueológico, Tarragona. Bolletino Arqueológico del Sudeste Español 2 (1945), p. 204. Felipe Mateu y Llopis, "Hallazgos Monetarios XII," No. 752, NumHisp 1955, pp. 130–31. Mateu y Llopis, "Hallazgos Monetarios XII," No. 794, NumHisp 1955, p. 137. Mateu y Llopis, "Hallazgos Monetarios VII," No. 600, NumHisp 1952, pp. 253–54. Now in Museo Arqueológico, Cordoba. Museu Nacional de Soares dos Reis, Porto. Annalen des Vereins für Nassauische A Itertumskunde 34 (1904), p. 27. L. Jacoby, Das Römerkastell Saalburg bei Homburg, pp. 365ff. AnnVerNassauAltertumskunde 26 (1896) and 37 (1907), pp. 4ff. Mitteilungen über römische Funde in Heddernheim 3 (Frankfurt am Main, 1900), pp. 10–61 and 4 (1907), p. 54.
. Revellio, "Das Kasteli Hüfingen," Der Obergermanisch-Rätische Limes 55 (Berlin/Leipzig, 1937), pp. 33–34. K. Bissinger, Funde römischer Münzen im Großherzogtum Baden 1 (Donaueschingen, 1887), p. 14, 35. R. Bodewig, "Das Kasteli Ems," Der Obergermanisch-Rätische Limes 36 (1937), p. 22. L. Jacoby, "Das Kasteli Zugmantel," Der Obergermanisch-Rätische Limes 32 (Heidelberg, 1909). A. D. Conrady, "Das Kasteli Obernburg." Der Obergermanisch-Rätische Limes 18 (Heidelberg, 1903). Bissinger, Baden, pp. 15–16 and (2nd ed. Karlsruhe, 1906), 98, p. 9. Seen in trade by the author. Mélanges d'archéologie et d'histoire 1964, pp. 51–90. Nero's aes consisted of asses, semisses and quadrantes in copper, and of sestertii and dupondii in orichalcum, with a limited issue of asses, semisses and quadrantes also in orichalcum. Orichalcum was originally a natural alloy, but by the middle of the first century a.d. the Romans made the alloy artificially by heating copper in a bed of calamine. The raw materials needed for the aes coinages were thus ordinary copper, copper suitable for processing into orichalcum, and calamine needed for the processing. From a group of coins in the Museo Nazionale, Naples. Now in Muzeo Nazionale delle Terme, Rome. J. Johnson, Excavations at Minturnae 1 (Philadelphia, 1935), p. 99. Museo Capitolino, Rome, believed to have been found in the city. NC 1970, pp. 96–97 and NC 1974, pp. 42–52. O. Davies, Roman Mines in Europe (Oxford, 1935), p. 60; and R. J. Forbes, Metallurgy in Antiquity (Leiden, 1950), pp. 272 ff. The ancients do not generally seem to have realized the metallic qualities of zinc, and apparently regarded the process as one which purified and strengthened the metal: cf. Davies Mines, Isidore, Etym. 16. 20.3. A detailed explanation of the manufacture of orichalcum in Roman times is given in Earle R. Caley, Orichalcum and Related Ancient Alloys, ANSNNM 151 (New York, 1964), pp. 92ff. Davies, Mines, pp. 94 ff. C. G. Bruns, Fontes iuris romani antiqui (7th rev. ed. Tübingen, 1909), pp. 289–93. See also discussion of these documents in Frank, Survey III, pp. 167–74. Pliny, NH 34.1.2: "Summa gloria nunc in Marianum conversa, quod et Cordubense dicitur. Hoc a Liviano cadmeam maxime sorbet et aurichalci bonitatem imitatur in sestertiis dupondiariisque." Pliny, NH 34.2: "Cyprio suo assibus contentis." Davies, Mines, pp. 177–78; the inscription CIL XIII, 4238 was found at Blauberg. Willers, "Neue Untersuchungen über die römische Bronze-Industrie von Capua und von Niedergermanien," Jahrbuch des provinzialen Museums zu Hannover 1906–7, p. 64. Willers dates the discovery between a.d. 57, when Pliny seems to have been in Upper Germany, and a.d. 74. Sydenham 150 and Laffranchi 151 have suggested that "westernstyle" groups can be distinguished among the Agrippa asses and Claudius' aes, although the detailed evidence of site finds has not yet been analyzed to settle finally whether or not their criteria are sound. 152 This mint seems to have been the successor to the mint at Lugdunum which issued the extensive Altar series up to the early years of Tiberius,153 a series which constituted the main currency of the Rhine frontier at the time, and again struck semisses of the Altar type under Claudius.154Lyons was in fact an eminently suitable place for a western aes mint, in a perfectly safe area yet conveniently situated to supply the small change needed by the frontier armies of the Rhine, Britain and Upper Danube, and equally accessible to the principal sources of copper. F. Lenormant, La monnaie III, pp. 185 ff. CIL VI, 42, 43, 44, 239, 791, 1145, 1607 etc. Frank, Survey V, p. 140. In "The Quality of Nero's Orichalchum,'' SM 1966, pp. 101-105, I have commented on the lower percentage of zinc in several of Nero's orichalcum coins of the non-globe mint, and suggested that many of the coins at Rome were struck from secondary alloy derived from remelted old coins. See BMC RE II, pp. lviii ff. Sydenham, Nero, pp. 30–31 and "The Mint of Lugdunum," NC 1917, pp. 82–83. L. Laffranchi, "La monetazione imperatoria e senatoria di Claudio 1º durante il Quadriennio 41–44 d.º Cr.º," RIN 1949, pp. 41–48, though Laffranchi there suggests that the western European mint may be in Spain. S. Jameson, "The Date of the Asses of M. Agrippa," NC 1966, pp. 95–124, on the other hand, argues that all three groups of Agrippa asses that she distinguishes were struck in Rome, but she does not support her argument with find evidence. The absence of countermarks from her group (a), and the presence of countermarks localized in the western provinces on groups (b) and (c) suggests to me that these latter two groups may be the product of a western mint. RIC, p. 91, nos. 359–371. RIC, p. 130, nos. 70–71. Strabo iv.6.11. Cf. Ammianus Marcellinus xv.11.17. M. P. Charlesworth, Trade-routes and Commerce of the Roman Empire (2nd ed. Cambridge, 1926), pp. 183ff. and 192ff. H. R. W. Smith's objections in Problems Historical and Numismatic of the Reign of Augustus (Berkeley, 1951), pp. 161-174, it should be noted, were directed against the view that Lugdunum was the sole gold and silver mint in the early empire; he did not attempt to deny that Lugdunum was a mint, though he strove to weaken Strabo's apparently straightforward statement of contemporary fact. He emphasized the difficulties in navigating the Rhone, but the numerous inscriptions of the companies of navigators of the Rhone and Arar (in CIL XIII) greatly undermine the force of this point as do the extensive Roman quays along the river at Lyons (O. Brogan, Roman Gaul [London, 1953], p. 103) and the extensive quays of more modern date at places like Avignon. In any case Agrippa's road system followed the line of the main river routes, and there were good roads up the Rhone valley. Sydenham, "Lugdunum," NC 1917, p. 55. Sydenham, NC 1917, p. 86. See BMCRE I Intro., and Sutherland Coinage in Roman Imperial Policy. For my objections to M. F. Grant's point of view in NC 1955, pp. 39–54 see p. 12 above. See Mommsen in Hermes 16 (1881), p. 645, n. 4. I have compared the relative proportion of altar to moneyers' and imperial aes under Augustus/Tiberius and of globe to non-globe aes under Nero in finds from Gaul and Italy in the appendix to my article "A Group of Early Imperial Aes from Augers-en-Brie," NC 1967, pp. 43–47. For the first ten years of Nero's principate the gold and silver struck at Rome bore tribunician dates TRP to TRP X, which clearly differentiated successive issues. During the first tribunician year to December 55 three aureus and denarius types were issued—one commemorating the deification of Claudius, the second with heads of Nero and Agrippina facing (Plate I, 2) and the third with jugate busts of Nero and Agrippina (Plate I, 3). Cat. 1–21, 35–53. Plate I.
Degrassi, I fasti, p. 16. The undated gold and silver is a coinage struck on a reduced weight standard, on which the portraits are all later than on the dated series. The legends NERO CAESAR AVGVSTVS and NERO CAESAR, both of which lack the praenomen IMP, must belong to the period before mid-a.d. 66. No significant chronological distinction can however be drawn between these two forms. Except on plated denarii, NERO CAESAR was merely used with the AVGVSTVS GERMAN ICVS type on which the reverse legend completed the titulature from the obverse. After Nero assumed the praenomen IMP in mid-66 there were two forms of obverse legend on the gold and silver: IMP NERO CAESAR AVGVSTVS and IMP NERO CAESAR AVG PP. The reverse types in the issue with IMP NERO CAESAR AVGVSTVS were taken directly from, and must therefore have directly followed, the preceding issue with NERO CAESAR AVGVSTVS; but on denarii with IMP NERO CAESAR AVG PP in addition to the types that had been used with NERO CAESAR AVGVSTVS and IMP NERO CAESAR AVGVSTVS there were three new reverse types peculiar to the issue: the anepigraphic type of an eagle between two standards; and fresh varieties of the Roma and Salus types with the legends in the reverse field. IMP NERO CAESAR AVG PP must thus have been the latest form of reverse legend on Nero's gold and silver. Issue 1 of the undated gold and silver coinage on the reformed standard had the obverse legends NERO CAESAR, and NERO CAESAR AVGVSTVS. In gold there were eight distinct reverse types: Augustus Germanicus; AugustusAugusta; Jupiter Custos; seated Roma; Salus; the Temple of Vesta; the Temple of Janus; and Concordia Augusta. 1a. Janus and Concordia types, with substantive issues of aurei (but accompanied by a token issue of denarii). 1b. The six reverse types of Augustus Germanicus, AugustusAugusta, Jupiter Custos, Roma, Salus and Vesta with substantive issues in both gold and silver. 1c. The continuing issue of Jupiter Custos and Salus types in both gold and silver. Cat. 22–29, 54–61, PLATES I–II. Issue 2 had the obverse legend IMP NERO CAESAR AVGVSTVS. Its aurei were struck in two reverse types, Jupiter Custos and Salus, both of which were taken over directly from the preceding issue. Besides these two types of Jupiter Custos and Salus, the denarii also used the seated Roma type from the preceding issue, but it is extremely rare and cannot have been struck in any numbers. Cat. 30, 31, 62–64. Plate II. 3a. Aurei and denarii with the reverse types of Jupiter Custos and Salus continued without change from Issues 1 and 2. Cat. 32, 33, 65, 66. Plate II. 3b. Denarii alone in two substantive types of Salus with its legend across the field rather than in the exergue and of the new eagle and standards. Throughout Nero's reign the issues of gold and silver ran closely parallel to each other; but a number of minor discrepancies between them clearly suggests that the denarii were in fact struck immediately after the similar aurei of each issue. It has been noted that in the dated group the Ceres type, which was abandoned during the issue dated TRP VIIII, is found on the aurei of that year but not on the denarii. Similarly in the undated series both Janus temple and Concordia Augusta types are comparatively common on the gold of the first issue, but on the silver the Janus temple type is not found and the Concordia Augusta is extremely rare. In the later issues with IMP NERO CAESAR AVG PP, the fresh forms of reverse type were introduced during the issue of the denarii, and have left no trace on the aurei. The relative proportion of the aureus types in TRP VII can be seen in the numbers represented in the large hoard from Pudukota (NC 1898, pp. 304–20); in other hoards which contain aurei of Nero TRP VII from Pompeii 1812 (Pompeianarum Antiquitatum Historia I.3 [Naples, 1860], pp. 250–51); Utrecht (Opgravingen op het dompe in te Utrecht 1934, pp. 49ff. ); Pontalbon (SNR 1900, p. 164); Zirkowitz (Mitteilungen CC Steiermark 2, 173; 3, 157; 5, 109); and Vienna (Jahrbuch für Altertumskunde 1909, pp. 90–95; in the collections of the BM, Oxford, Glasgow, Paris, Milan and Turin; and in the coins from Sale catalogues represented in the BM collection of photographs. For a list of these varieties under Nero see the catalogue below. For a fuller discussion of Nero's plated denarii see Chapter 2 and its references. The varieties of plated denarii bearing Nero's titulature are listed on p. 243. A careful examination and analysis of the coins which seem to lack SC enables us to define more closely the range and scope of the issues which genuinely omitted it. When worn and tooled examples are excluded, it is clear that the aes is invariably the product of the mint of Rome, and falls into two compact chronological groups. The first consists of copper asses, semisses and quadrantes. The second, slightly later than the first, consists of orichalcum sestertii, dupondii, asses and quadrantes. But each of these denominations, both in copper and orichalcum, is subsequently struck by Nero with the traditional SC on the reverse. Obv. : NERO CLAVDIVS CAESAR AVG GERM PM TRP IMP PP Head bare r. Rev. : Nero laureate in flowing robes of Apollo Citharoedus walking r., l. holding lyre, r. playing it. No legend or SC. Obv. : NERO CLAVD CAESAR AVG GERM PM TRP IMP PP Head bare r. Obv. : As 221 but head bare l. Obv. : NERO CLAVD CAESAR AVG GERM PM TRP IMP Head bare r. Obv. : NERO CLAVDIVS CAESAR AVG GERMANIC Head bare r. Obv. : As 246 but head bare l. Obv. : NERO CLAVDIVS CAESAR AVG GERMAN Head bare r. Obv. : As 249 but head bare l. Obv. : NERO CLAVDIVS CAESAR AVG GERM PM TRP IMP PP Head bare l.
Genius standing l. by lighted altar, holding patera and cornucopiae. Obv. : NERO CLAVD CAESAR AVG GERM PM TRP IMP P Head bare r. Obv. : NERO CLAVD CAESAR AVG GER PM TRP IMP PP Head bare r.
Mattingly and Sydenham described the rare coins with the anepigraphic reverse type of Apollo as dupondii with an As type, 18 but they are undoubtedly copper asses. Specimens which are not patinated have the normal red color of copper, and spectrographic analysis has confirmed this for the British Museum example. (Nero's dupondii at both Rome and Lugdunum were always struck in orichalcum). The weights of the anepigraphic asses range from 11.42 to 12.59 gm., which is well below that of the dupondii without SC but very close to that of the other copper asses without SC. The issue of these copper asses was not especially small. I have found 34 obverse dies used in conjunction with five reverse dies of the anepigraphic Apollo type, 8 of the GENIO AVGVSTI, and 19 of the Apollo PONTIF MAX TRP IMP PP type. There are very few die links and none which connects different forms of obverse legend or different reverse types; pieces from identical dies are comparatively unusual; and there are almost as many obverse as reverse dies. Cf. Michael Grant, From Imperium to Auctoritas (Cambridge, 1946), p. 121. H. Mattingly, The Emperor and His Clients (Todd Memorial Lecture, Sydney, 1948), p. 6. Sutherland, Coinage in Roman Imperial Policy, pp. 152 ff. BMCRE I, pl. 48, 6. BMCRE I, pl. 44, 10. F. Gnecchi, I Medaglioni Romani (Milan, 1912), pl. 142, 2. Anne S. Robertson, Roman Imperial Coins in the Hunter Coin Cabinet I (London/Glasgow/New York, 1962), pl. 22, 73. RIN 1913, p. 22 and pl. 1, 4. Found in the Tiber, now in the Terme Museum, Rome. BMCRE I, pl. 44, 7. Bought in Rome, said to have been found in the city. BMCRE I, pl. 44, 9. BMCRE I, pl. 44, 8. RIN 1913, pp. 21 f., and pl. 1, 4. RIC Hunter I, pl. 22, 72. Found during excavations in Rome, RIN 1909, p. 20, 5, and Gnecchi, Medaglioni, pl. 141, 10. Copper asses of the Apollo and Genius' types have frequently been found in the western provinces, but they are the product of the distinctive Lugdunum mint. They always have the Lugdunum globe and characteristic bust truncation; the reverse always has SC; and in the Apollo series they use the form of legend PM TR POT IMP PP which is peculiar to Lugdunum on the copper asses. Plate IX, 242, 246, 255. Plate I, 8, 14, 19. Plate I, 14, 19, 20. Plates X, 278; XI, 283–301. Obv. : NERO CLAVDIVS CAESAR AVG GERM PM TRP IMP PP Head laur. r. Rev. : No legend. Roma helmeted and draped seated l. on cuirass, r. holding wreath and resting l. hand on parazonium. Obv. : NERO CLAVDIVS CAESAR AVG GERMANIC Head laur. r. Obv. : NERO CLAVDIVS CAESAR AVG GERM Head laur. r.
Gaming table ornamented by two griffins. On it, urn l. and wreath r. Against its central leg rests a round shield. A further indication of their approximately contemporary date is given by two overstrikes in the British Museum 45 and in Stockholm. Both seem to be copper asses of Nero without SC overstruck by the same pair of dies. In each case the reverse overstriking die is of the Genius type used for asses without SC, and the obverse overstriking die is of the type used at Rome in the issue of copper semisses without SC. Mattingly attributed the British Museum example to Lugdunum 46 and implied that it belonged to the opening phase of the new mint. He wrote 'The obverse die is very small and the head is in the Roman style: the reverse is of normal size and of Lugdunum style. Traces of the original coin (a dupondius of the mint of Rome) with rev. Temple of Janus obv … CLAVD CAESAR AVG G … still remain." We can, however, confidently attribute all the component parts of the overstrike to the mint of Rome. It has a copper flan of 14.94 gm.—the metal having been established by spectrographic analysis. As it is not of orichalcum, it can not have been originally a dupondius. Yet for an As, the highest denomination struck in copper, it is heavy but within the weight range of the copper asses without SC. Of its original obverse type, "CLAVD CAESAR AVG G …" and "… AR AVG GER PM TR P IMP P …" can be read on the London and Stockholm pieces respectively—a normal legend for Nero's copper asses without SC. Little remains of the original reverse type but there seem to be traces of a standing figure which may well have been that of Apollo citharoedus. The overstriking obverse die is a copper semis obverse die of the Roman mint: NERO CLAVDIVS CAESAR AVG GERM PM TR P PP, a youthful, bare, head of Nero to right. The overstriking reverse die is of the GENIO AVGVSTI type without SC, a type found exclusively at Rome. Mattingly's attribution to Lugdunum seems to be based on his belief that the Genius type was normally struck at Rome only in orichalcum. 47 He did not realize that there was a series of copper asses at Rome of the Genius type omitting SC and his description of the overstrike does not make it clear that the type generally lacks SC. RIN 1913, p. 22 and pl. 1, 3. RIC Hunter I, pl. 22, 82. BMCRE I, pl. 45, 4. Gnecchi, Medaglioni, pl. 141, 12. The weight of this and of the seven following examples are given by G. Elmer, "Die Kleinkupferprägung von Augustus bis Traian,'' NZ 1934, p. 20. BMCRE I, pl. 45, 3. The weights of this and of the two following examples are given by Elmer, NZ 1934, P. 20. The semisses Ars Classica Sale xv, 1438, and BM 259 cited above. As the semis BM 259 (BMCRE I, pl. 45, 3). BMCRE I, p. 273, 372 and note. BMCRE I, p. 243, note*. See my note, "The Numismatic Evidence for the Neronia." Classical Quarterly 1958, pp. 192–94. A helmet placed r. on column; against the cippus rests round shield; behind, spear slanting upward to r.
The coin in the Capitol Museum came from excavations in Rome, but the other examples are unprovenanced. Although these quadrantes have no portraits and thus give little indication in themselves of their date and place of minting, finds suggest that the quadrantes with SC in both copper and orichalcum belong to the mint of Rome; and the use of IMP as a cognomen throughout shows that the whole series falls before mid-a.d. 66. The pattern of their issues generally shows the same development as that of the asses at Rome and they seem to be parallel to them. Gnecchi, Medaglioni, pl. 142, 3. The second group of aes without SC consisted of sestertii, dupondii, laureate and radiate head asses and quadrantes, all in orichalcum. The different denominations of this group seem to belong to the same general period, and to have been struck fairly soon after the issue of asses and semisses without SC in copper. An examination of the dies of the sestertii without SC has made it possible to define far more clearly the extent of the group. It is necessary, of course, to exclude all sestertii on which the letters SC have been deliberately tooled out and those where the SC may have disappeared through wear and corrosion. Among the sestertii that seem genuinely to omit SC, it is usually possible to substantiate the same reverse die from several coins, none of which has any trace at all of SC. Several of these reverse dies belong to a die-linked chain in which all the reverse dies similarly omit SC. There is inevitably an element of uncertainty when a reverse die without SC is known merely from a single coin and is not die-linked to other sestertii without SC; but dies of all the main reverse types of sestertii omitting SC—Adlocutio, Annona, Congiarium and Decursio (showing Nero riding right accompanied by two foot soldiers)—are firmly placed in die-linked groups. Obv. : NERO CLAVDIVS CAESAR AVG GERM PM TRP IMP PP Head laur. r. aegis. Nero standing l. on platform accompanied by praetorian prefect, addressing three soldiers, two of whom hold standards. Ceres seated l. holding torch and ears of corn; before her Annona standing holding a cornucopiae. To l., a high platform on which Nero sits; in front, a seated official distributes largess to man ascending ladder. To r. a low platform on which Nero sits l.; beside him, the prefect standing; in front, soldier distributes largess to a citizen. Nero on horseback galloping r., preceded and followed by a foot soldier. Nero on horseback galloping r. followed by horseman holding vexillum. Obv. : As 70 but head laur. l. Obv. : NERO CLAVD CAESAR AVG GERM PM TRP IMP PP Head laur. r. aegis. Obv. : As 79 but head laur. l.
Madrid R. A. 28.68 gm. Obv. : NERO CLAVD CAESAR AVG GER PM TRP IMP PP Head laur. r.
Most of the sestertii without SC are unprovenanced, although one of the DECVRSIO type showing Nero accompanied by two foot soldiers was found at Ostia. 54 There is, however, no doubt from general considerations of their style and idiom that they were products of the mint of Rome. Heads in right profile invariably show traces of the aegis in front of Nero's bust; this is frequently seen on sestertii at Rome but never at Lugdunum which always had the globe. The obverse legends often use the abbreviations CLAVDIVS and GERM, which are repeatedly found at Rome but never at Lugdunum. The bust truncation is closely similar to that on many coins of the Roman mint, and is quite different from the characteristic M truncation of Lugdunum. Though most of their reverse types were used at both Rome and Lugdunum in the SC series, the type of DECVRSIO with Nero accompanied by two foot soldiers was used exclusively at Rome. The condition and state of wear of several pieces clearly show that the group passed into general circulation as ordinary sestertii, whatever the original purpose of the issue had been. The reverse types of these sestertii without SC were all early types at the mint of Rome. No authenticated piece without SC has the praenomen IMP in Nero's obverse titulature; and these reverse types were never employed at Rome with the praenomen IMP, even in an SC series. This places them all before the middle of a.d. 66 when Nero took the praenomen "imperator" into his titulature. A 108 P 106 Decursio Vex. A 106 P 109 Congiarium r.
A 107 P 111 Decursio Vex. A 109 P 118 Decursio r.
A 111 P 129 Decursio Vex. A 116 P 127 Decursio Vex. A 117 P 131 Decursio r.
A 119 P 133 Congiarium l.
A 120 P 136 Decursio Vex. The most common form of obverse legend on SC sestertii without the praenomen IMP at the Roman mint: NERO CLAVD CAESAR AVG GER PM TRP IMP PP occurs only once, and the fairly common form: NERO CLAVDIVS CAESAR AVG GER PM TRP IMP PP is never found on sestertii that omit SC. The portraits on the sestertii without SC are invariably early for the aes, but seem to be closer to the orichalcum asses without SC than to that of the copper asses without SC. The obverse portraits in right profile always showed Nero's hair "in gradus formata," sometimes in a pronounced forward arch, but at other times with the front curl bending upward back over itself in a less advanced way. 55 Some obverse dies showed Nero's hair in thick rope-like strands, a treatment closely paralleled in the obverse of an orichalcum As without SC. Sometimes the engraver did not make full use of the field for his obverse portrait; and sometimes the letters of the obverse legend were badly spaced and crowded at the end. This strongly suggests the product of an engraver unaccustomed to work in the dimensions of a sestertius die and with no satisfactory models to copy. One obverse die used with two reverse dies omitting SC was also used on a uniface piece. 56 All this very strongly suggests an early place in Nero's aes issues. RIC Hunter I, pl. 21, 55. BMCRE I, pl. 42, 5. BMCRE I, pl. 48, 3. Now in the Museum at Ostia. There are no signs of SC on its reverse. Although the coin is somewhat corroded it almost certainly never had SC, as sestertii of this type without SC are not uncommon whereas those with SC are extremely rare. Helbing Sale October 24, 1927, 3429. See table of sestertius weights, Appendix II, Table 5. Rev. : VICTORIA AVGVSTI No SC or mark of value. Victoria draped, flying l., r. holding wreath, l. a palm. Obv. : As 177 but head bare l. Obv. : As 177 but head laur. r. Obv. : NERO CLAVD CAESAR AVG GERM PM TRP IMP PP Head laur. r. Rev. : No legend, SC or mark of value. Front view of Macellum Magnum. Obv. : NERO CLAVDIVS CAESAR AVG GERM PM TRP IMP PP Head rad. r. Obv. : NERO CLAVDIVS CAESAR AVG GERM PM TRP IMP P Head rad. l. Obv. : NERO CLAVD CAESAR AVG GERM PM TRP IMP PP Head rad. l. Rev. : SECVRITAS AVGVSTI No SC or mark of value. Securitas std. r. on throne, l. holding sceptre, r. elbow resting on back of throne. Obv. : NERO CLAVD CAESAR AVG GERM PM TRP IMP P Head rad. r. Obv. : NERO CLAVD CAESAR AVG GER PM TRP IMP PP Head rad. r.
There is no evidence from site finds to establish the areas in which the dupondii without SC circulated, but their affinities of type and style clearly show that they were the product of the mint of Rome. SECVRITAS AVGVSTI is represented in two distinct ways on the dupondii without SC. Sometimes she is fully draped in a thin chiton, the presence of which can easily be seen, even on worn specimens, by the folds of its overlap. 66 On others she is shown naked to the waist, round which her garments are drawn in heavy folds. 67 Both representations were used on SC dupondii at Rome, 68 but only the first was employed at Lugdunum. On the anepigraphic Macellum dupondii the steps are always shown inside a regular rectangular encasement, and the steps themselves are flanked at each side by an unmistakable baluster. 69 In slightly varied forms this was the regular representation of the steps at Rome. 70 At Lugdunum, however, the encasement of the steps became formalized into a quasi-triangular representation narrowing at the top. 71 The position of the balusters was still indicated, but the engravers seem to have lost all clear idea of their function. On the dupondii without SC seven of the ten obverse dies show Nero's head radiate. In the main SC series Rome always employed the radiate and Lugdunum the laureate head. The three exceptional dies on dupondii without SC with the bare and laureate heads have no Lugdunum affinities. Their obverse legends NERO CLAVDIVS CAESAR AVG GERM PM TR P IMP PP and NERO CLAVD CAESAR AVG GERM PM TR P IMP PP belong exclusively to Rome, and their bust truncation was quite distinct from the characteristic Lugdunum form. The weight range of the later dupondii with SC alone is slightly lower again than that of dupondii with SC and the mark of value īī. There is evidence of a rise in the value of orichalcum in these years, and during the issue of orichalcum asses there was a marked lowering of the weight standard, later portraits always occurring on asses of lower weight. The natural explanation of the slightly higher weight range of the dupondii without SC, is that they are slightly earlier than the main Roman issue with SC and the mark of value īī. Mattingly's figure of 18.46 gm. (284.86 grains) as the average weight of 5 dupondii without SC seems to be an unfortunate misprint. 75 His average is considerably higher than the individual weights of any of the five coins which he can have used. The average of the three pieces described in the Catalogue is 16.47 gm. ; and if we include two dupondii without SC, whose weights are recorded in the British Museum's cast collection, the average comes to 16.21 gm. (250.2 grains). Equally significant are the reverse types. Dupondii without SC never have the praenomen imperator 76 themselves, nor are the same types subsequently used in an SC series with the praenomen. This is further evidence that these types are indeed the early dupondius types of the mint of Rome, and reinforces the evidence of portraiture and weight that the dupondii without SC preceded the main issue. BMCRE I, pl. 43, 6. BMCRE I, pl. 43, 7. BMCRE I, pl. 44, 3. RIC Hunter I, pl. 22, 64. Gnecchi, Medaglioni, pl. 142, 4. See table of dupondius weights Appendix II, Table 5. Obv. : NERO CLAVDIVS CAESAR AVG GERMANICVS Head laur. r. Rev. : PONTIF MAX TR POT IMP PP No SC or mark of value. Nero laur. advancing r. in the flowing robes of Apollo citharoedus, l. hand holding a lyre and r. playing it. Rev. : GENIO AVGVSTI No SC or mark of value. Genius standing l.; l. holding cornucopiae, r. patera. Obv. : NERO CLAVDIVS CAESAR AVG GERMANICVS Head rad. r. Obv. : NERO CLAVD CAESAR AVG GERM PM TRP IMP PP Head rad. r.
The laureate head asses without SC 78 constitute a closely dielinked group. The radiate head asses without SC 79 are not linked with this group but seem to be associated closely with it. As a group, the orichalcum asses without SC follow the copper asses without SC and precede the main issue of orichalcum asses with SC and the mark of value ī. The stage of their development is shown by the advance in treatment between A341 and A342, two die-linked obverse dies. A341 still shows Nero's hair in strong rope-like strands as on some of the copper asses without SC. But A342, 80 while not much more developed in age, heralds the new approach of the main aes series 81 in its careful rendering of Nero's curls. During the course of the main series of orichalcum asses with SC and ī there was a reduction in the weight standard of the denomination, and coins of lower weight are invariably found with the later portraits. Plotted against the weights of the main series, the orichalcum asses without SC are all comparatively high, and must belong to the period before the weight standard was reduced. 82 As with the other denominations, the combined evidence of portraiture and weight suggests clearly that the orichalcum asses without SC preceded the main series. It is interesting to note that the group without SC seems to be quite separate from the main issue with SC and ī; and no die links have yet been noted between the two groups. Quite a number of coins, however, were struck without SC, 83 and some obverse dies remained in use after the development of a die flaw. The flaw in A343 can be seen clearly on the example in Copenhagen and at a later stage on the coins in the BM, Paris and Vienna. 84 The flaw which can be seen on the coins in Milan and Glasgow struck from A344 had deteriorated further before the coin in Naples was struck from the same obverse die. The praenomen was assumed during TRP XII (a.d. 66/67) and regularly used thereafter by Nero; see pp. 4–7. RIC Hunter I, pl. 22, 65. Helmet placed r. on column; against the cippus rests a round shield; behind, spear slanting upward to r.
See Appendix II, Table 7, table of orichalcum as weights. Altogether 5 obverse and 12 reverse dies have been noted. Various explanations have been offered for Nero's aes without SC. Gnecchi regarded them as medallions; Grant has called them forerunners of medallions; and Mattingly and Sydenham have suggested that some are patterns for the Lugdunum mint, while some may have been used as presentation pieces by the Emperor. Each of these suggestions, however, gives rise to serious difficulties. Gnecchi's 85 view is: 1) the pieces can be distinguished from the senatorial issues only by the lack of SC; 2) the omission of SC shows them to be products of the imperial mint; 3) in this respect they are prototypes of imperial medallions 86 and were given to the people on the occasion of congiaria, feasts, games, etc. Gnecchi started from the assumption that the mint was basically divided into a senatorial officina issuing bronze and an imperial one which issued gold and silver; and his description of the aes without SC as "imperial" presupposes the old dyarchic constitutional theory, which the researches of recent historians have done much to undermine. 87 Gnecchi's suggestion that the coins without SC were given to the people on the occasion of congiaria, feasts and games is extremely interesting, but he adduced no evidence from ancient authorities to support his suggestion. We know that donatives were given, but we have no evidence that aes without SC was given on these occasions. Indeed other considerations make it most unlikely that this was its purpose under Nero. Coins without SC are found in all denominations down to semisses and quadrantes. It is difficult to see the point of presentation farthings! Although aes was issued at Rome for the last four years of Nero, all the coins without SC belong to the beginning of that period. Were the presentations then confined to a single year? The only congiarium of Nero mentioned by the ancient authors was in a.d. 57, 88 long before Nero began to issue aes either with or without SC. Grant 89 has modified this view to avoid some of Gnecchi's worst difficulties. While he only discusses the dupondii in detail, he apparently intends his explanation to cover all the denominations of Nero without SC. He claims that these dupondii are distinguished from the ordinary series by other features than the mere omission of SC: 1) they are extremely rare, "Such aes issues apart from the omission of SC are usually identical in type, and (as analysis has now shown) alloy, with further aes pieces which were clearly issued in millions [sic]. Thus dupondii with the present type [VICTORIA AVGVSTI] and SC are very common indeed, and must have been issued in enormous quantities (at more than one mint), … whereas the coin illustrated here [VICTORIA AVGVSTI] without SC is of considerable rarity;" 2) the weights of pieces without SC are considerably higher. Grant quotes the average weight of dupondii at Rome omitting SC as nearly 285 grains while his estimated standard for the SC pieces is 236 grains. "This difference cannot by any means be accounted for by the comparative absence of wear of these restricted issues, for that factor does not, in this denomination, make a difference of more than 12 to 14 grains 3) "they show a superiority, or at any rate a distinctiveness, of portraiture and of style." These unorthodox features, Grant claims, justify the description of ''pre-medallions"—a term which he applies to other coins of limited circulation. Finally he suggests an occasion for their issue which avoids the difficulties to which Gnecchi's view gave rise, by connecting them with the decennalia of Nero and the fiftieth anniversary of the death of Augustus. Grant's account of the additional features which distinguish the dupondii without SC is, however, open to serious objections. Dupondii without SC are undoubtedly rare, but Grant overstates their rarity in comparison with dupondii of the same type with SC. The dupondii without SC were struck at Rome, and their rarity should be compared with that of other issues at Rome of the same types with SC. In the major accessible public collections from which my material is drawn, I have counted five reverse dies of the VICTORIA AVGVSTI type without SC and 29 dies of the same type with SC. In any case should we regard rarity as our criterion for a medallic issue? Grant's strongest argument should be the completely different weight standard which he claims for the dupondii without SC. But his figures are based on those given by Mattingly which, are at least 34 grains too high—the result, apparently, of a misprint. 90 As has been indicated, the weight range of Nero's dupondii without SC is virtually the same as that of the pieces of Claudius, and only slightly higher than the earliest group of Neronian dupondii with SC and the mark of value īī. There is in fact a considerable overlap; their weights do not remove the dupondii without SC into a category apart; and the slight difference merely indicates a slightly earlier date for their issue. Grant's third distinctive feature is "a superiority, or at any rate a distinctiveness, of portraiture and of style." But equally fine portraits of equally fine style can be seen in many coins of the main dupondius series with SC, and thus style here is not in itself a sufficient criterion. There is indeed a distinctiveness about some of the portraits, but this is probably due to the slightly earlier and experimental nature of the pieces. The only differentiating features, then, which it seems can legitimately be ascribed to the dupondii without SC are a comparative rarity, a slightly higher weight range than the normal dupondii, and a certain distinctiveness in portraiture. Only the last two represent an advance on Gnecchi's position, and they hardly justify more than the assertion that the coins are slightly earlier than the main series with SC. It is still possible to assert, as Gnecchi did, that they are precursors of medallions, but the only reason that can legitimately be offered is that they lack SC. Mattingly has suggested of these coins without SC, that "some of them were patterns for the Lugdunum mint, some possibly presents for the Emperor's friends, some are due to the account of modern improvers of coins." 91 The last group has been rigorously excluded; the difficulties in regarding any of the coins as presentation pieces have been discussed above; and an analysis of the aes without SC leaves little ground for supposing that any of them was used as a pattern by the reconstituted Lugdunum mint. The principal forms of legend on the aes without SC were used exclusively at the mint of Rome. The forms: NERO CLAVDIVS CAESAR AVG GERM PM TRP IMP PP and NERO CLAVD CAESAR AVG GERM PM TRP IMP PP used on sestertii and dupondii without SC were also used in the main series with SC at Rome, but never at Lugdunum. Only the comparatively rare form NERO CLAVD CAESAR AVG GER PM TRP IMP PP was used on sestertii and dupondii in the series with SC at both Rome and Lugdunum. The copper asses and semisses without SC show Nero's head bare, as do the copper asses and semisses at Lugdunum, whereas the Roman copper asses with SC always have Nero's head laureate; but the first Lugdunum issue of asses copied a Roman orichalcum As with SC and the mark of value, and the first Lugdunum issue of semisses copied an ordinary Roman orichalcum semis. Moreover the Apollo and Genius copper asses without SC demonstrably circulated in Rome and Italy and the series is known from more than thirty obverse and as many reverse dies. The characteristic forms of reverse type on the aes without SC were all subsequently used in the series with SC at Rome, but some of them were never employed at Lugdunum; and even when Lugdunum used a reverse type that had previously been used in the issue without SC, it seems rather to have copied its representation from the later Roman coins with SC, e.g., one representation of the Decursio type (with Nero riding right preceded and followed by a foot soldier) was issued at Rome both with and without SC (Plate II, 74; III, 78) but never at Lugdunum, and the Lugdunum form of the Macellum type (Plate XIV, 490, 493; XVI, 501) always had the legend MAC AVG, whereas that of the issue without SC was anepigraphic (Plate VI, 180, 184; VII, 186). As both the groups of aes without SC preceded the main aes issues at Rome and were thoroughly Roman in type and content, they might possibly be regarded as patterns for the mint of Rome. The evidence of finds, however, and the state of wear of many examples without SC make it abundantly clear that the coins without SC did in fact circulate. It is, of course, possible for patterns to slip into circulation; but each of Nero's types without SC is known from several dies, the copper asses without SC are known from more than thirty obverse dies, and some of the obverse dies in the second group without SC remained in use after the development of die flaws. All this distinctly suggests that the two groups of aes without SC constituted two small issues. The explanations of Gnecchi, Grant and Mattingly are all based on the assumption that S(enatus) C(onsulto) means 'struck by order of the Senate" and seek to explain how Nero's aes without SC could have been struck without this authorization. But in a recent study Kraft 92 has questioned the validity of this assumption. He notes that by the 6o's b.c. there was a clear and specific relation between SC and the type of the coins on which SC is found, that there was a personalized application of these new principles in Octavian's favor. He asks why SC is found regularly on the aes of the Augustan moneyers but not on their gold and silver, unless SC refers specifically to the type content of the aes. He analyzes the few issues of aes of the Julio-Claudians that lack SC, such as the SPQR OB CIVES SERVATOS SPQR MEMORIAE AGRIPPINAE and EXSC corona civica types and notes that most of them specifically illustrate and define honors conferred publicly on the imperial house or are presentation types. Kraft argues that such an absence of SC indicates that the origin of the formula on the aes lay in the honors with which it was associated, not in the authorization as such of the coinage; and he concludes that SC means "honour in the form of the corona civica, etc., bestowed on the Emperor by decree of the Senate." It is particularly difficult to accept Kraft's thesis for the varied reverse types of the later Julio-Claudian coinages. During this period, some reverse types have a specifically senatorial reference relating to the type such as DIVO AVGVSTO SPQR on the sestertii of Tiberius, EX SC OB CIVES SERVATOS with the corona civica on aurei, denarii and sestertii of Claudius, and EXSC with the corona civica on the prereform aurei and denarii of Nero. But otherwise the aes denominations normally had the senatorial reference whatever their reverse types might be; and the gold and silver never had the senatorial references SC even when it used the same types as the aes. Under Claudius, for example, CONSTANTIAE AVGVSTI is used as a type on all three metals, but only the aes uses the type with SC. Again in Nero's post-reform coinages, the seated Roma and Janus temple types are used on all three metals, but only the aes denominations use the types with SC. 95 In this important respect the aes denominations are differentiated sharply from the gold and silver. If there is no other senatorial reference arising out of the type, the aes denominations deliberately introduce a reference to the Senate in the form of SC. The notable exception is the aes of Nero without SC. The reverse types of these issues: Adlocutio, Annona, Congiarium and Decursio on the sestertii; Macellum, Securitas and Victoria on the dupondii; Apollo and Genius on the asses; Roma and the Table on the semisses omit SC in Issues I and II at Rome, but use it in Issues III and IV. By this stage SC can hardly refer to the type alone. Otherwise it should be found equally on all aes issues with the same types. We can therefore accept Kraft's view about the original significance of SC under Augustus but we must equally accept Mattingly's correction 96 of Kraft—that there was subsequently a change of use and the original reference of the SC may itself have been ambiguous. There is still a "concordia" of emperor and senate, but it is not only the general concordia expressed by the grant of the civic oak, but a more special concordia concerned with the issue of token coinage. The prominence given to SC certainly decreased markedly during the Julio-Claudian period. Whereas the Augustan moneyers used the letters as a distinct type, around which they set their names, Tiberius often substituted another reverse type and relegated SC to a comparatively unimportant place in the field. Under Nero and later emperors SC found a place only in the reverse field, and by the second century the letters became noticeably diminished in size. The whole process is undoubtedly symptomatic of the declining importance of the Senate. Nero's aes without SC was the first aes to be struck at Rome for more than a decade, and this in itself would greatly facilitate any change in type and reference. The omission of SC from his first two issues in a.d. 63/64, shortly before he dropped the complimentary EXSC from the gold and silver and at a time when his relations with the senate had become considerably strained should, I believe, be regarded as a deliberate and calculated attempt to abandon a complimentary formula the reality of which had disappeared and the importance of which had considerably waned. On Nero's gold and silver there is a comparable development. The issues of a.d. 54/55 to 59/60 have the type of the corona civica and the senatorial reference EXSC (Plate I, 2, 4, 10). The formula continues when the types are changed to Ceres, Roma and Virtus in a.d. 60/61 (Plate I, 11–14, 19, 20) but it is ultimately dropped in the reformed issues from a.d. 64 onward (Plate I, 22ff.). Kraft refers EXSC to the type, the corona civica, and when the type is changed he regards the continued use of EXSC as a "vestigial organ." Mattingly inverts the argument and suggests that EXSC cannot refer only to the corona civica because of its persistence when the new types were introduced. He sees a deliberate ambiguity suggesting "civilitas"—that the Senate had some part in the dated gold and silver issues. The distinction is a fine one, but the point is clear. A senatorial reference derived in part from the type persists as a complimentary reference when the type is changed, and is ultimately dropped. It is dropped about the same time as the issues of Nero's earliest aes—the two issues that omit SC. Issue I of Nero's aes, the first complete aes issue in a range of types to omit SC during the Julio-Claudian period, consisted of copper asses and semisses—denominations which were indistinguishable from those already in circulation, and in which the only innovation was the omission of the traditional senatorial reference. But Issue II, similarly without SC, made a drastic break with previous monetary practice. Hitherto sestertii and dupondii alone had been struck in orichalcum but now for the first time a general orichalcum coinage was introduced for all the aes denominations. This was closely followed by Issue III which struck the same range of denominations in orichalcum with the same range of reverse types, but now had SC on all denominations and marks of value on the dupondii, asses, semisses and quadrantes. All the later issues of Nero's aes at both Rome and Lugdunum invariably included SC. The change in policy at this juncture, and the decision to include once more the traditional senatorial reference on the aes seems to be occasioned by a need to associate the Senate with the new and unfamiliar monetary system. It is probably no coincidence that SC was restored to Nero's aes in the same issue as the marks of value were introduced. Gnecchi, Medaglioni, pp. xxxii ff.